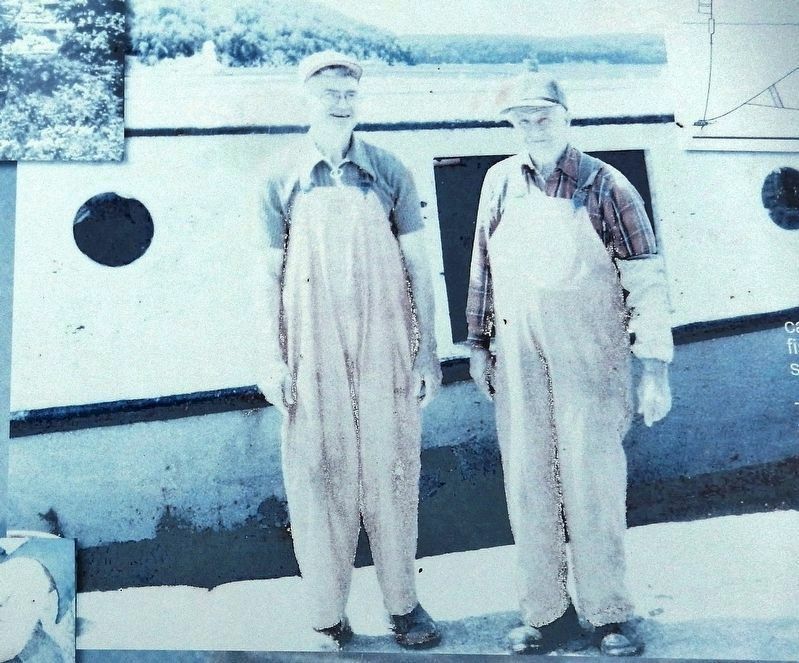 Howard and Emery Weborg had been fishermen all their lives. Howard began fishing with his father Alfred in 1917. Soon Emery joined them fishing on their father's boat, the Golden Girl. At age 64, Alfred suffered an angina attack and died while out fishing. Upon Alfred Weborg's passing, their uncle Willie took over the boat that was owned in part by the Weborg brother’s mother Minda. Five years later in 1944, Willie decided to sell his share of the business and the Golden Girl to Howard and Emery. They fished with that old boat for one more year, then decided a new one was needed. Selling the Golden Girl in 1945, they ordered a new boat, built to their specifications at the Sturgeon Bay Shipbuilding and Dry Dock Company. The new boat had a steel hull and house, with an aft pilothouse. 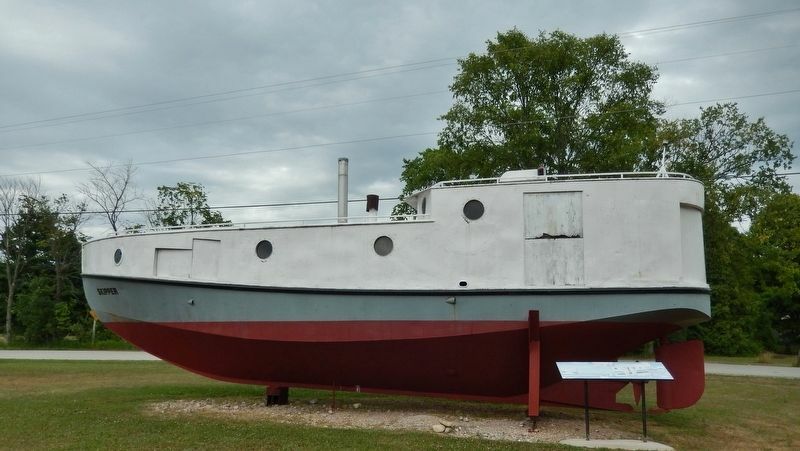 She has a 42-foot long steel hull and was powered by a 30-36 horsepower Kahlenberg oil engine. It cost them $12,000.00, and they named her Skipper after their father, who carried the nickname for many years. 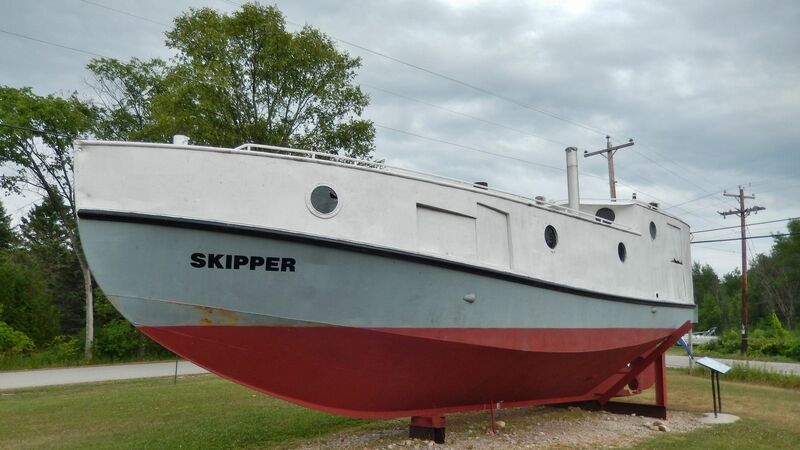 Finished fall of 1945, the Skipper was the first all-steel boat to fish out of Gills Rock. into operation soon after launch, a typical day started at Weborg's wharf at 5:30 a.m. They loaded the net and fish boxes, torched the engine, and departed a half hour later. They worked this schedule six days a week, six to seven months a year. They were known to go out in all kinds of weather. Even when the Washington Island ferry was laid up, the Weborgs would still lift nets. Out on the lake, Howard and Emery normally would lift eight boxes of nets, remove the fish, and set the nets back. They strung their own nets, either at Gills Rock or at their shed in Sand Bay. The two of them could string a new net of 1,200 feet in a day. Helping on shore, their wives Ruby and Grace worked several days a week in the wharf’s net sheds. Throughout their partnership, Howard took the lead with Emery acting as his second. They fished together for nearly 50 years, 40 of them from just one boat, the Skipper. The gill net is the most versatile of all net types. It can be set on any bottom, at any depth, and will catch almost any fish. It is fished throughout the year, even under the ice in winter. It can also be made selective by varying the size of the mesh. each end of each net the two cords are connected with a bridle. Each net is three to four hundred feet long and they are packed three or four to a box. The principle on which the net works is also simple. The corks and leads make it stand like a fence on the bottom. Fish don't see it. Small ones pass through, those too large can't enter the mesh, other fish enter up to their gills and the monofilament line prevents their escape. 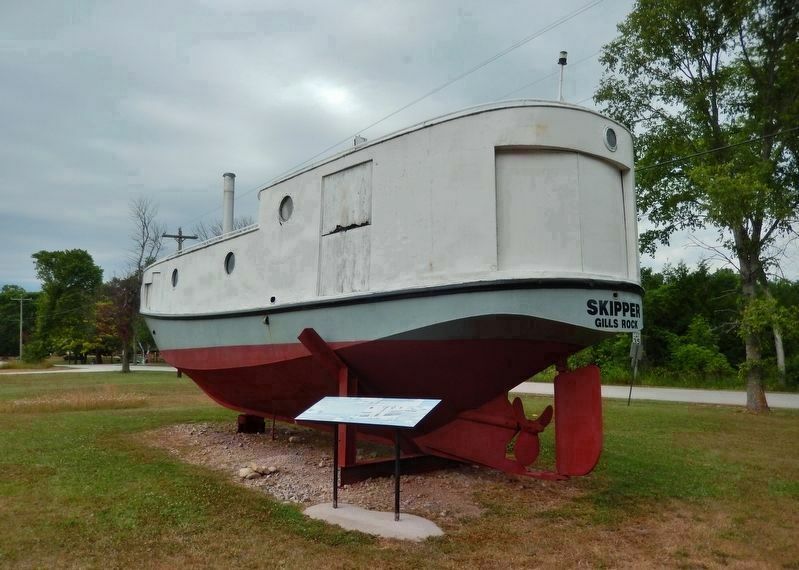 Howard and Emery Weborg donated the Skipper to the Door County Maritime Museum in 2002. Location. 45° 17.443′ N, 87° 1.263′ W. Marker is in Gills Rock, Wisconsin, in Door County. Marker is at the intersection of State Highway 42 and West Wisconsin Bay Road, on the left when traveling east on State Highway 42. Touch for map. Marker is located near the northwest corner of the intersection, beside the subject boat. Marker is at or near this postal address: 12724 West Wisconsin Bay Road, Ellison Bay WI 54210, United States of America. Touch for directions. (approx. 4.4 miles away); Nature of Sister Bay (approx. 8.6 miles away); Village of Sister Bay (approx. 8.6 miles away); Anderson Dock (approx. 11.6 miles away). Touch for a list and map of all markers in Gills Rock. More about this marker. Marker is a long, rectangular, composite plaque, mounted horizontally, at waist-level, on metal posts. More. Search the internet for The Skipper.